Ridding the clam broth of grit by allowing it to settle in a tall, narrow container and pouring it off carefully to leave the grit behind is easy, but not necessarily foolproof. If you don’t want to take any chances, strain the broth through a fine-mesh strainer lined with damp cheesecloth. Because both the salt pork and clams are salty to begin with, tread lightly with extra salt to season the chowder. Some might consider the lemon to be unorthodox, or even misplaced, but I think it gives the clams an exclamation point! 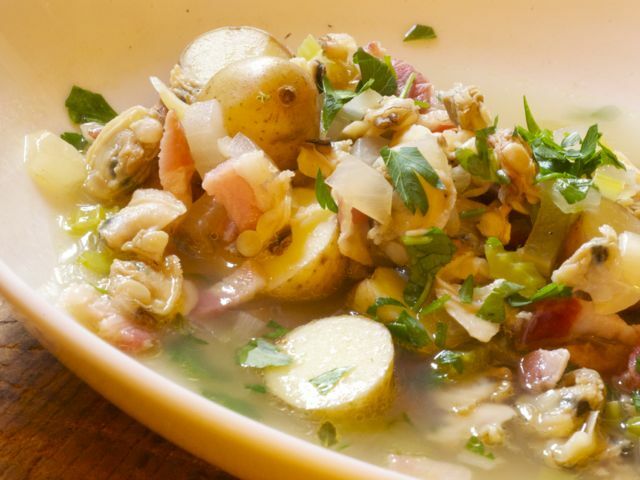 Likewise, the chives would probably be considered fancy at most clam shacks, but I like the light onion essence they bring, not to mention the green, which this stew can use. This is adapted from Jasper White’s 50 Chowders. Serve oyster crackers or common crackers alongside. Bring 2 cups of water to a boil in a large, heavy Dutch oven over high heat. Add half the clams, cover, adjust the heat to medium-high, and cook until they open, 4 to 7 minutes, stirring them once during the cooking time. With a slotted spoon, transfer them to a large bowl. Add the remaining clams to the pot and cook until they open, 4 to 7 minutes longer. With the slotted spoon, add them to the bowl with the first batch (discard any that have not opened). Reserve the broth (you should have about 4 cups). When the clams are cool enough to handle, remove the meats from the shells, rinse them if necessary, roughly chop them (you should have about 1¾ cups), and refrigerate until ready to use. Meanwhile, transfer the broth to a tall, narrow container. Allow it to settle for about 10 minutes, then pour it carefully into another container, taking care to leave the grit behind at the bottom of the first container (see Introduction, above). Cover and refrigerate until ready to use. Wash out the pot, add the salt pork, and cook over medium-low heat, stirring occasionally, until browned and crisp, about 18 minutes. Pour off all but 1½ tablespoons of the fat (leave the salt pork in the pot). Add the onion, celery, bay leaves, and thyme, and cook, stirring frequently, until the vegetables are softened, about 5 minutes. Add the clam juice, reserved clam broth, and potatoes, adjust the heat to medium-high, and bring to a simmer (do not boil). Adjust the heat to low, cover, and simmer until the potatoes are tender, about 15 minutes. Off the heat, add the chopped clams, lemon juice, and pepper to taste, and rest the chowder for about 30 minutes for the flavors to meld. Gently reheat the chowder over medium heat (do not boil). Remove the bay leaves, taste, and adjust seasoning with additional pepper (and salt), if necessary. Add the parsley and chives, stir them in, and serve at once.